Our Strength & Conditioning programs encompass a wide variety of goals. Whether you are looking to improve general fitness, improve your sports performance or trying to stay active as you age we believe that every program starts with a good base. The beginner will be able to master basic movements before moving forward. The seasoned athlete will get what they need to move to the next level. Our Certified Strength & Conditioning Specialists and Certified Personal Trainers utilize cutting edge techniques that are proven and currently being used within the professional and collegiate sports setting. What is a Certified Strength & Conditioning Specialist? Certified Strength & Conditioning Specialists (CSCSs) are professionals who apply scientific knowledge to train athletes for the primary goal of improving athletic performance. They conduct sport specific testing sessions, design and implement safe and effective strength training and conditioning programs and provide guidance regarding nutrition and injury prevention. Recognizing that their area of expertise is separate and distinct, CSCSs consult with and refer athletes to other professionals when appropriate. The Certified Strength and Conditioning Specialist (CSCS) program was created in 1985 to identify individuals who possess the knowledge and skills to design and implement safe and effective strength and conditioning programs for athletes in a team setting. The credentialing program encourages a higher level of competence among practitioners and raises the quality of strength training and conditioning programs provided by those who are CSCS certified. Today, more than 21,000 professionals from a variety of academic and professional backgrounds hold this prestigious credential. This diverse group includes strength coaches, athletic trainers, physical therapists, personal trainers, physicians, chiropractors, researchers and educators. 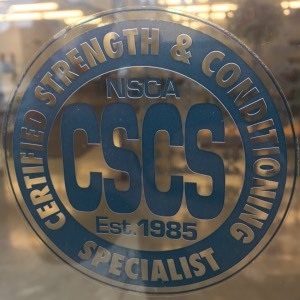 The CSCS is the only strength training and conditioning certification to be nationally accredited by the National Commission for Certifying Agencies (NCCA) and has been nationally accredited since 1993.